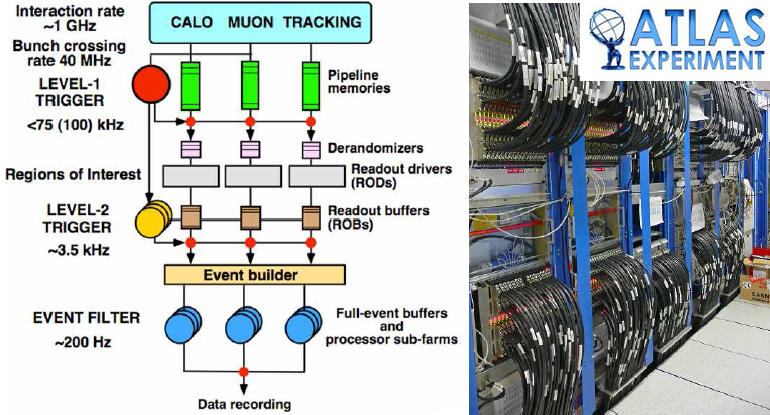 Indeed the reconstruction that LHCb now runs in the trigger farm is identical to that which we run offline. The intention during run 2 is that the calibration used in the trigger farm will be “good enough” for most analyses, with no need for further processing offline. We can achieve this by running the calibration in real time on specially selected events from the first few minutes of each LHC fill, and applying the update 9if needed) to the rest of the fill. Only analyses that need the ultimate precision will have to e.g. refit vertices offline. All this is of course a plan: the software and procedures are ready, but we will have to see how it all works out in real life with the 2015 data. – If the online and offline reconstructions are identical, why run it again offline? Why not write out from the HLT farm the reconstruction results (tracks, vertices, PID objects) *instead* of the detector hits? – If the online and offline reconstruction are identical, why not do the physics preselections online, and write out only the physics objects that will end up in the analysis ntuple? We call this concept the “Turbo Stream” (there were papers at CHEP 2015 on this) and we plan to demonstrate this with a number of important analyses of the 2015 data.